I grew up in a household where meatballs were served regularly. Mostly they were the kind made by church ladies for potluck suppers–my mother being one of them. 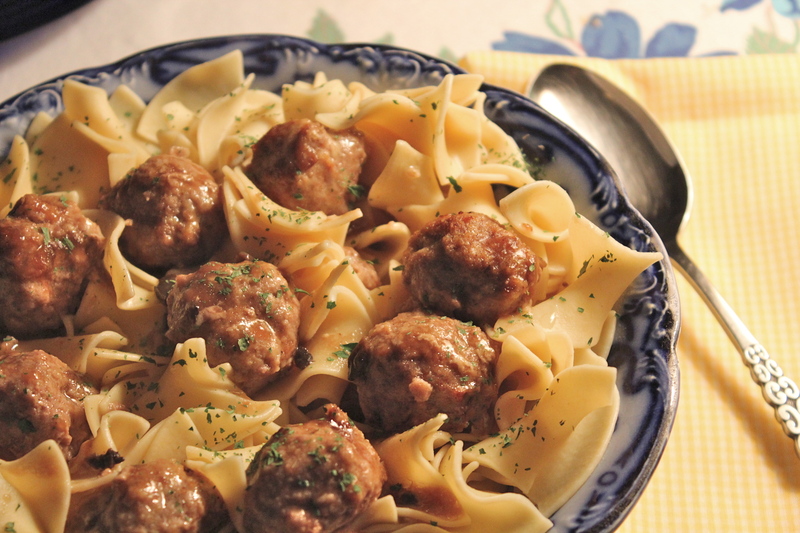 I remember gobbling up tiny sweet and sour meatballs made as appetizers, giant-sized Italian meatballs balancing on top of a plate of spaghetti, and then there were the Swedish meatballs, floating in a gravy rich with sour cream. So with a foot in both the Swedish and Italian heritage communities, I think I know something about meatballs. 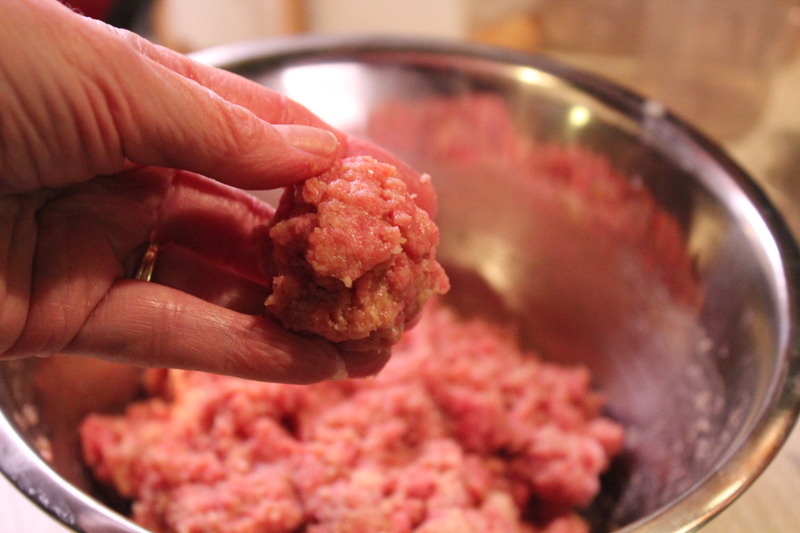 As I grew older and had a family of my own I developed my own meatball-making style. They’re still a comfort food to me, but I’ve tried to make them healthier by using leaner meats, less fats in the sauce or gravy, and more spices to increase flavor. Meatballs make a satisfying meal and can almost always be made ahead and frozen. I like to make twice the amount I need for a meal and freeze the extras. It’s reassuring to know you have the basis for a meal that can be prepared quickly when you don’t have time to cook. 1. Keep it lean. Opt for meat that is 90% lean. If you want to use a fattier meat, such as pork for flavor, combine it with something leaner like turkey breast which is 99%lean. 2. Use whole grain binders. Typically meatballs use bread or breadcrumbs as a binder. Use wholegrain versions or brown rice to add fiber and nutrients. 3. Use plenty of herbs and spices. The saying “fat equals flavor” is true, but if you cut back on fat you must make up for its flavor by adding dried or fresh herbs and spices to bump up the flavor. 4. Change how you serve them. A healthier meatball is great but not very appetizing if served over a pile of white rice. So think of other sides to pair them with like polenta, whole wheat noodles, or brown rice. If you’re making a meatball sub use a whole grain roll. 5. Don’t overmix. 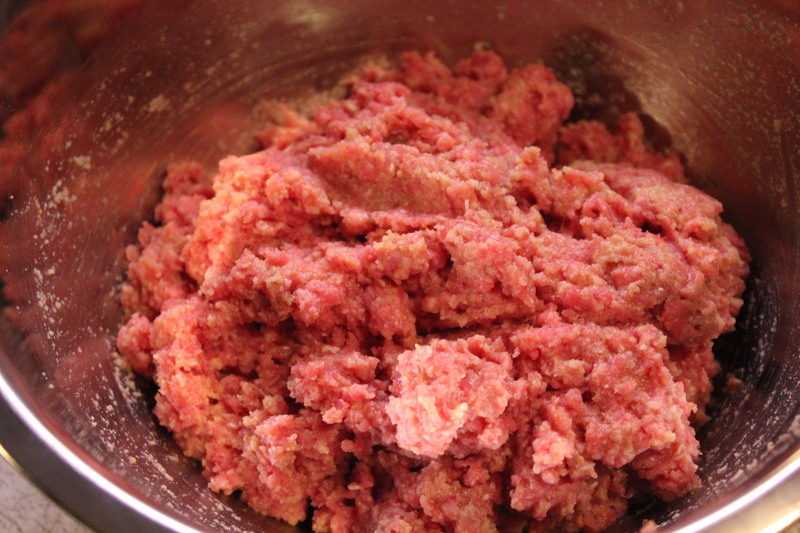 Be careful to mix the ingredients just till they’re combined and handle gently when forming the meatballs, otherwise they will be tough. 6. Cook smarter. There is no need to cook meatballs in tons of oil… If cooked in a skillet , just a tablespoon of olive oil will provide enough lubrication to get them started. The advent of non-stick pans has been a great help in this regard. Meatballs can also be baked on a baking sheet lined with foil for easy cleanup. 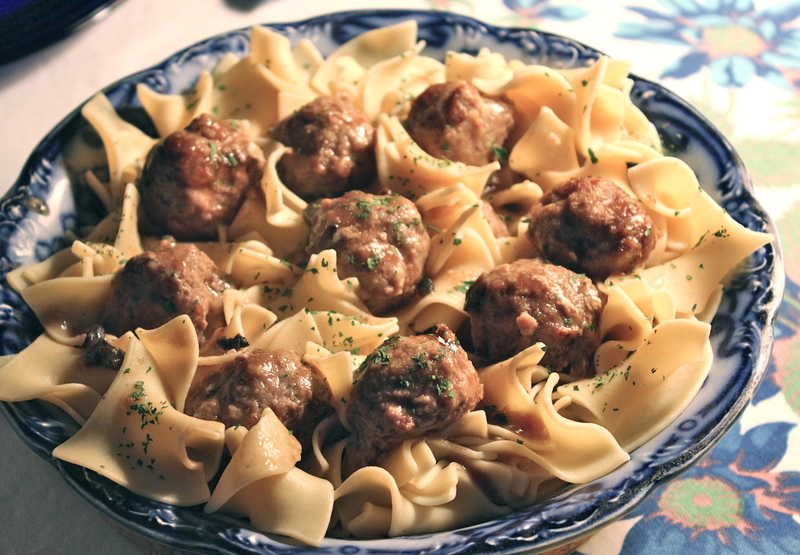 In the weeks ahead I would like to share with you a few of my recipes for meatballs, so today we will start with Swedish meatballs. 1. Preheat oven to 350* and spray a 2-quart baking dish with non-stick spray. 2. In a large mixing bowl whisk together the egg and the milk ( or beef broth). Add the dry breadcrumbs and spices, and mix with the egg mixture. Allow to stand a few minutes to allow the breadcrumbs to absorb the liquid. Add the chopped onion and crumbled beef. Gently mix together all the ingredients. 3. Mix all together lightly, and shape into 1 inch balls. Place on a lightly greased baking sheet. Meatballs are about the size of golf balls. 4. Bake at 350* for about 20 minutes. Remove from the oven and drain the meatballs if needed. Place in the greased baking dish. In a separate bowl, whisk the soup with the evaporated milk until smooth. Pour over the meatballs. 5. Return to the oven and bake for another 15 – 20 minutes to heat through. Sprinkle with parsley before serving. 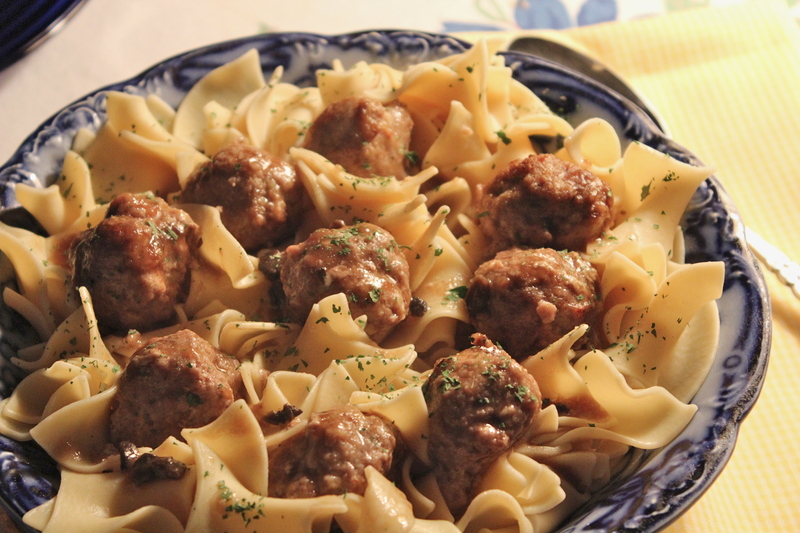 Meatballs served over whole wheat egg noodles. SOURCE: This is a major modification of my mother’s recipe. Hi Heidi, They are delicious and healthy, too.